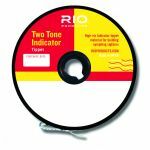 Rio freshwater fly lines are designed to excel at required casting and fishing needs, and feature cutting edge technology for maximum versatility and performance. Most fly lines stretch about 30%, which means you're losing almost a third of the energy you put into every cast, mend and hook set. That's why Rio are building their InTouch lines around ultra-low stretch ConnectCore technology. Remove the stretch, regain all that lost energy and sensitivity.